KPIT Technologies Limited & Jnana Prabodhini organizing ‘vSolve 2019’ -problem solving competition on 13th & 14th February 2019 at KPIT Pune(Hinjawadi). Vivek Ponkshe (Deputy Secretary, Jnana Prabodhini),Tushar Juvekar (Head CSR,KPIT), coordinators , informed about this initiative through a Press Release. This competition is organized through KPIT’s Educational initiatives under the CSR umbrella in association with Jnana Prabodhini Pune. 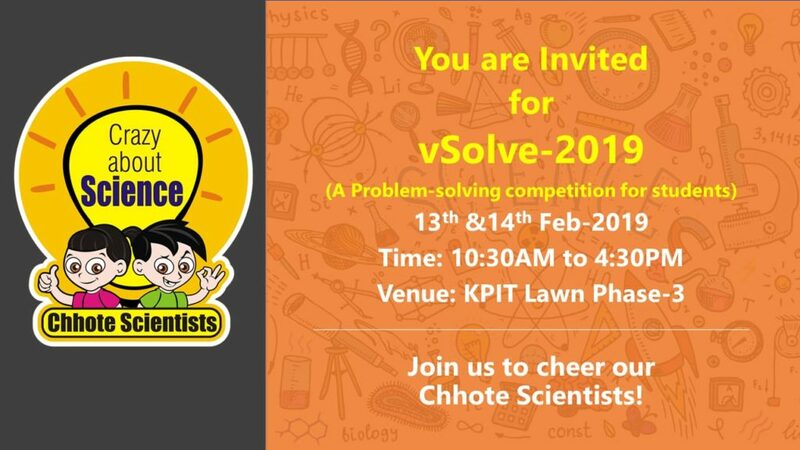 vSolve- a problem solving competition is held every year on the occasion of National Science Day that marks the completion of the annual calendar for ‘Chhote Scientists’ ,KPIT’s flagship CSR initiative. Chhote Scientists has been at the forefront of KPIT’s Educational initiatives under the CSR umbrella. An effort to bridge the learning gap in classroom and real-life application of science, the influence is mushrooming into a larger picture. What began as an effort of impacting 800 children in around 20 schools in Pune in the first year (2012), is now seen reaching out to 177 schools in the current calendar year with 15,000 students being exposed to it, across 15 cities of India. This is 5th Year of competition. On 13th February ,200 selected Students from 40 government schools across Pune, who were trained under the Chhote Scientists program exhibit solutions that they developed by applying scientific principles under the guidance of KPIT volunteers. On 14th February , 100 selected Students from 20 Atal Tinkering Labs (ATLs) will be participating to solve more complex problem related to electroics.